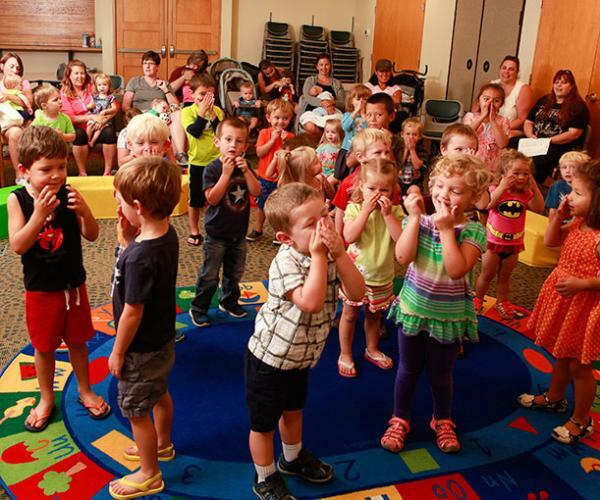 Want an active storytime with books, songs, music, and dancing for your preschooler? Then Dance, Rhyme, & Read is for you! Held on Monday mornings at 10:35am (and Wednesday mornings at 10:00am!). This program is for ages 3-6 and their grown-ups and lasts for 25 minutes. This storytime promotes early literacy skills through books, rhymes, music, movement, and FUN! Please pick up a storytime ticket at the children's desk beginning 15 minutes before the start of storytime. To accomodate fire code, we will allow 20 families in the room. For those planning on attending 2 storytimes in one day, preference for the 2nd storytime will be given to those families who have not yet attended a storytime. Tickets are first come, first served and cannot be held for friends. We apologize in advance for any inconvenience. Please contact Andrea for more information at andrea@clearviewlibrary.org.